Compost is a nutrient-rich, biologically active soil amendment made from decomposed organic wastes. The composting process starts when biodegradable materials are combined in a proper mixture and level of moisture. Bacteria, fungi, and other creatures break down compost feed-stocks into a stable soil-like humus that is rich in nutrients and beneficial microbes. At Dickinson College Farm, food waste collected from the College Dining Hall is combined with leaves from our local township. These materials are piled in large windrows, which are turned to generate heat, add oxygen, and speed up the breakdown process. 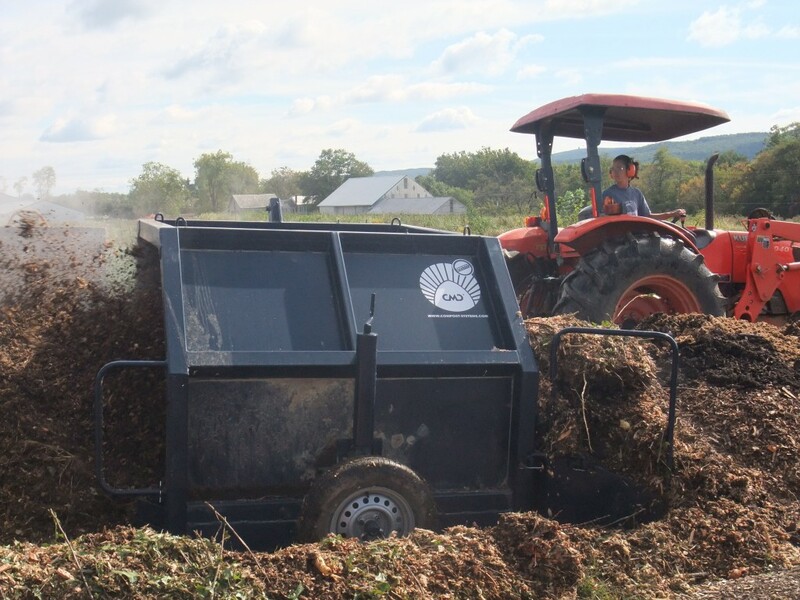 When the windrows no longer generate heat when turned, and the original materials are no longer recognizable, the finished compost is applied to the soil where farm produce is grown. 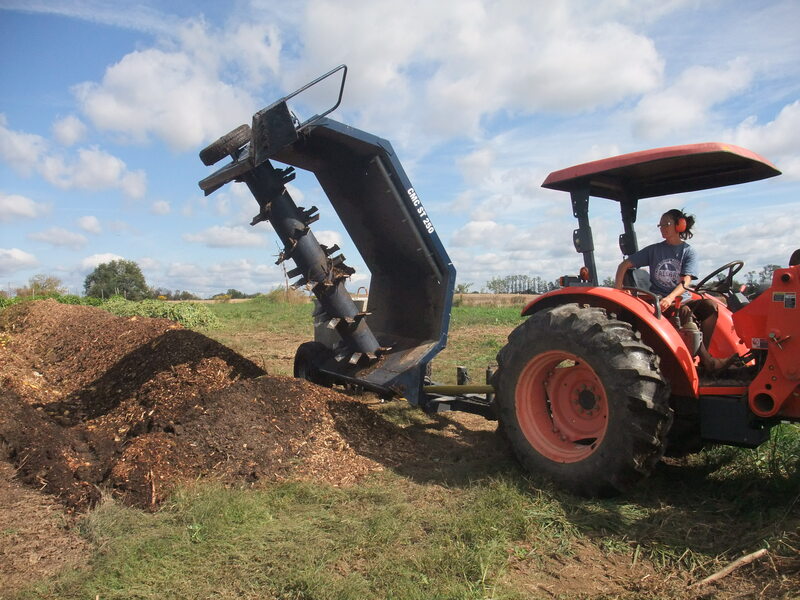 The compost benefits the farm by feeding the soil food web with nutrients and microbes while also increasing soil water holding capacity and overall soil quality. Dickinson College’s Department of Dining Services operates multiple dining establishments that provide food for approximately 2,355 full-time students and 773 employees of the college. We currently collect about 700 lbs of pulped food service waste per day. The waste, which is collected in green 10-gallon bins, is taken to the farm, where the bins are first emptied into the bucket of the farm’s tractor. 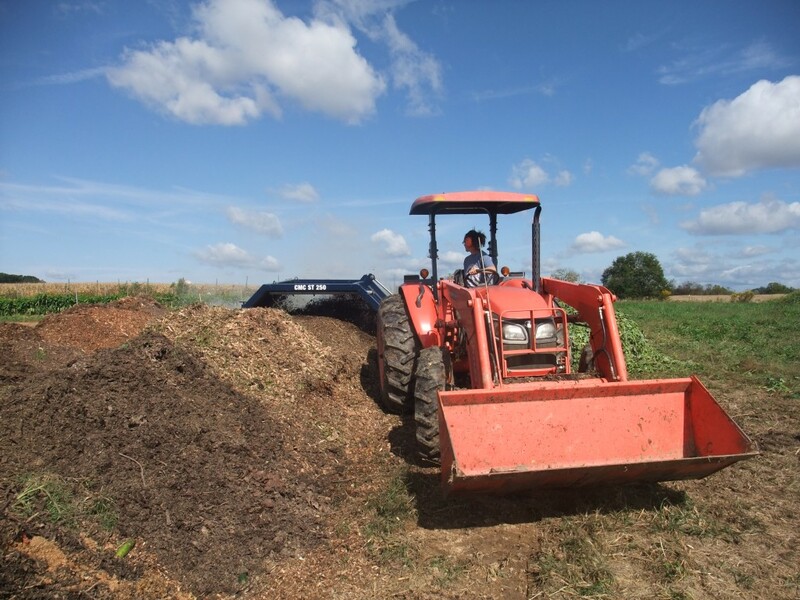 We then mix the food waste with leaves, mulch hay, or wood chips, and add it to one of our existing piles to begin the process of windrow composting. Once a windrow grows sufficiently large, it is covered with a compost cover to manage moisture, prevent weed growth, and discourage crows. The piles are turned as needed to accomplish aeration and reignite the decomposition process. Our compost piles may be turned 2-3 times or more over the course of a year before the organic materials (food waste, leaves, wood chips) have broken down sufficiently and become ready to use. Up until 2012, turning was done with a tractor bucket loader, or with pitchforks when the farm was starting out as the student garden. 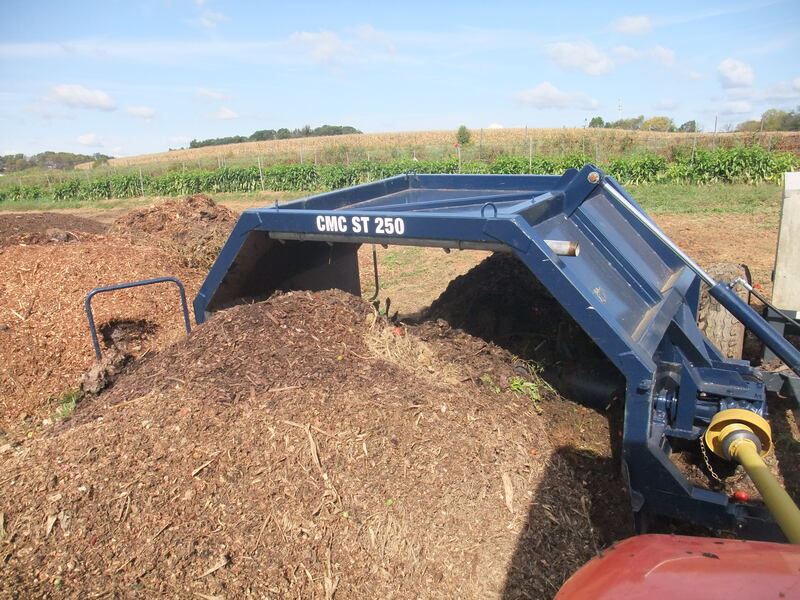 In 2012 we purchased a mechanical compost turner that allows us to turn the piles more efficiently, resulting in a faster composting process and higher quality finished product. Completing the circle, the compost is used in the cultivation of vegetables that are sent back to the dining hall for students, faculty and staff to eat! Check out a YouTube Video about our compost program, created by Emily Bowie ’14! The Dickinson College Farm was awarded a Department of Environmental Protection Composting Infrastructure Development Grant. This $93,000 award enablede College to purchase of a commercial grade food pulper, which allows for composting of pre- and post-consumed food waste. The pulper compacts solid waste into a semi-dry pulp, reducing waste volume by over 50%. After the food waste is pulped, it is collected in 10 gallon green bins with lids that are easily and safely transported to the farm’s composting facility. As a direct result of the composting program, sink garbage disposals have been eliminated across the entire dining services operation, lowering the college’s water and energy consumption. In addition, by reducing the food services waste that is sent to landfills by over 50%, the college saves up to $10,800 annually in tipping fees and $1,200/yr. in trash bags purchases. Student workers started to pick up salad bar scraps (approximately 50 pounds per day) from the cafeteria. 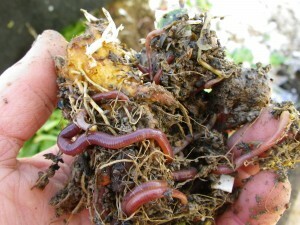 This waste was mixed with leaves collected from the community in hand turned compost piles at the Dickinson College Student Garden. In the spring, rainbow-colored trash cans were placed in the College Dining Hall and the campus-wide composting initiative as we know it began. 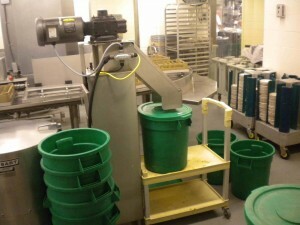 Students had the opportunity to scrape their own plates into these bins during breakfast seven days per week. These bins were then collected each day by garden workers. The following fall, the compost program was successfully expanded to include lunch. When students came back from winter break in 2006, they were greeted with new compost bins featuring a counter on which to rest trays while scraping plates. The compost bins were collected each day by garden workers and brought to the campus’ new composting site. The Student Garden partnered with Dickinson’s Department of Facilities Management to manage the compost piles. While the student gardeners collected, transported, and incorporated new food waste, Facilities supplied the piles with woodchips made from tree, shrub, and leaf debris from campus. Facilities Management was also responsible for turning the piles for effective and timely decomposition. This campus-wide effort had an immediate impact on the amount of food waste that Dickinson College sent to our local landfill. The Student Garden composted approximately 800 pounds of food waste each week. In 2007, the Dickinson College Farm was awarded a Department of Environmental Protection Composting Infrastructure Development Grant. This $93,000 award enabled the College Farm and campus Dining Hall to significantly increase their efficiency with the collection and composting of food waste, allowing us to handle approximately 91,000 additional pounds of material annually. We used the grant to purchase of a commercial food grade pulper, the Hobart WastePro Pulper, which allows for 100% composting of pre- and post-consumed food waste. The pulper compacts solid waste into a semi-dry pulp, reducing waste volume by up to 88 percent. Dickinson College participated in the annual Compost Recyclemania Competition, which is affiliated with EPA’s WasteWise program. During this two-month competition, we had the opportunity to weigh the efforts of students and campus on composting. The results indicated an average of 700 lbs of food waste being composted each day of the week, up from an estimated 800 lbs of food waste per week just one year prior. Our efforts landed us in the top rankings of US Colleges committed to campus-based composting initiatives! Dickinson College placed first among Pennsylvania schools in a mid-Atlantic regional RecycleMania contest sponsored by the U.S. Environmental Protection Agency. In the course of the ten-week competition, Dickinson diverted 100,910 pounds of waste from landfills or incinerators (compost was just one component). That’s 30.28 pounds of diverted waste per student! 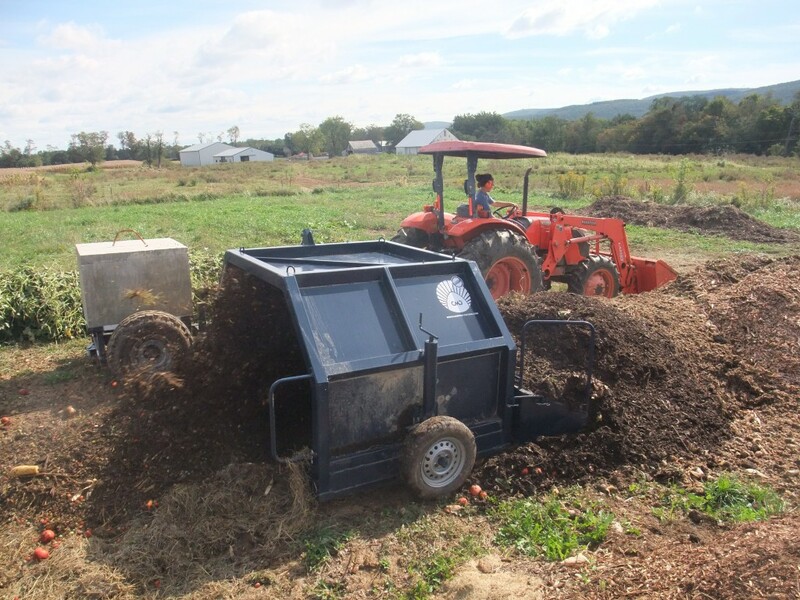 We purchased our compost turner from Autrusa.